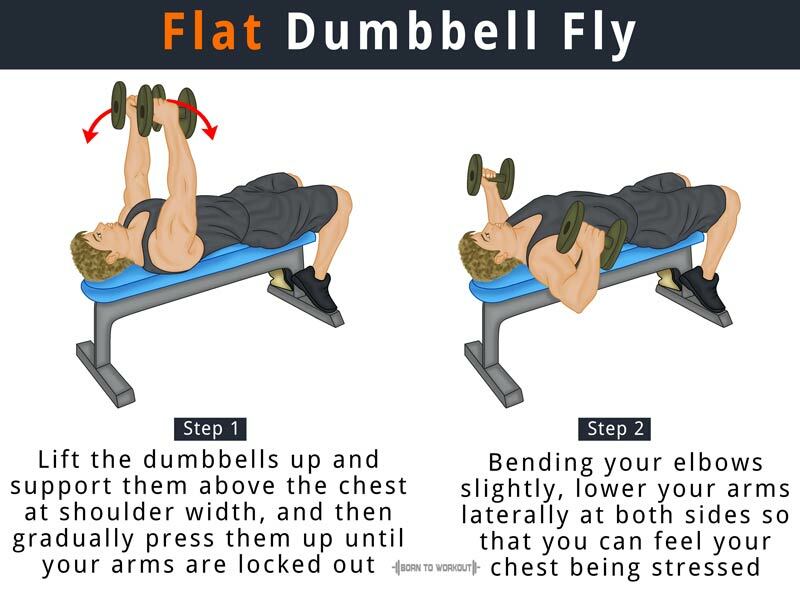 Unlike other variations, the flat dumbbell fly directly targets your chest while you perform the movements on the horizontal plane. It works the front and top of your shoulders, as well as the pectoral muscles of your chest, which helps in improving flexibility and mobility of the upper part of your body. Lie down on the floor or a flat bench, holding two dumbbells with the palms facing each other. Keep the dumbbells in a resting position on top of the thighs. Use your thighs to lift the dumbbells up and support them above the chest at shoulder width. Press the dumbbells up until your arms are locked out. It is your initial position. Bend your elbows slightly and lower your arms laterally at both sides so that you can feel your chest being stressed. Make sure you maintain the angle at the elbow while performing the movement. Bring the weights back to the original position while squeezing your chest muscles. Hold the movement for a second when at the top of muscle contraction and repeat for the recommended number of reps.
Make sure your arms remain stationary throughout the movement but allow only your shoulder joints to move. Avoid banging or touching the weights together when at the top of the movement to keep tension on the target muscle groups. Do not squeeze or hold the dumbbells excessively tight because it could over recruit your forearms and biceps, which would reduce stress in your chest muscles.